I'm behind on my New Year's post, as I'm still trying to figure out how I felt so busy and yet have so few finishes for 2015. In the meantime, head over to Stitchin at Home for a free block pattern. 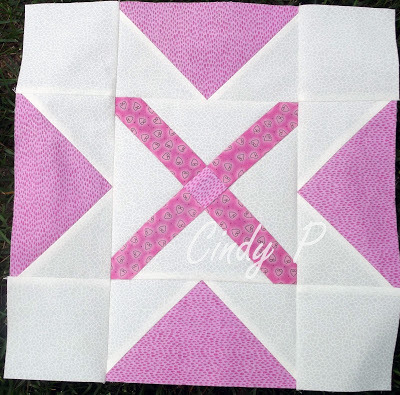 Cindy designed Double Cross last summer for her guild BOM and ended up using a different block instead. She has decided to offer this one as a blog freebie to usher in the new year. I tested the block pattern for her last summer. I have to say I like the block much better in her fabric! When you check out her blog. you'll see that these blocks look great set together. Enjoy! Isn't Cindy clever! That's a terrific block and looks great when all set together. I really like your version, it would make a great border too. Thanks for sharing. Cute block. I bet it would make an interesting looking quilt. That's a really cute block that goes together well to make a pretty quilt. Thanks for sharing the link. ---"Love"
I like the look of your block, different fabrics give the block a different look. Thanks for testing the block for me.